Fit crust into 15x10x1-inch pan, pressing firmly into corners and sides. Fold extra crust underneath and slightly on top edges of pan; poke bottom and sides of crust with fork. Bake 9 to 11 minutes or until golden brown; remove from oven, and reduce oven temperature to 350°F. Cool crust on cooling rack 15 minutes. Meanwhile, in medium bowl, beat sweetened condensed milk, egg yolks and Key lime juice with whisk until well blended. Pour into baked pie shell; spread evenly. Bake 10 to 12 minutes or until filling is set. Cool on cooling rack 15 minutes. Cover and refrigerate until chilled, at least 1 1/2 hours. In large bowl, beat whipping cream with electric mixer on high speed until thickened. Add sugar; beat to soft peaks. Spread over top of chilled slab pie. Sprinkle lime peel over top. Store covered in refrigerator. Key limes, grown in Florida, are smaller and rounder than the common, more familiar green--or Persian--limes, and their color is more yellow than green. Although Key limes are less widely available than the common lime, bottled Key lime juice is generally available. 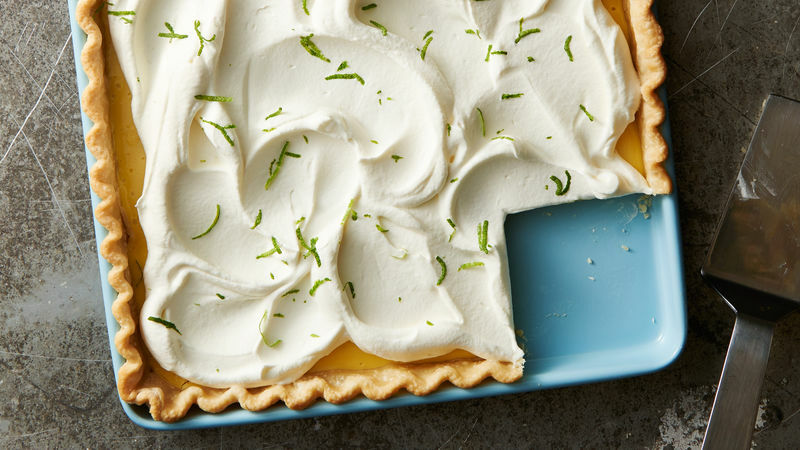 If you like your Key lime pie to have a green color instead of the characteristic yellow, beat in a few drops green food color with the condensed milk.